The Liturgy Committee, made up of all student volunteers under the guidance of Mrs. Linda Miller, meets after school to plan school Masses and Prayer Services. Students receive training in order to become familiar with use of the Catholic Liturgical order, Liturgical Calendar, and elements of the Mass than can be adapted for school use. Members of the Liturgy Committee support our worship experience with their creativity and leadership. Students interested in joining the Liturgy Committee may sign up on the Liturgical Survey in August through their religion class. A total of 20% of a graduating class are elected to the National Honor Society in the junior year. Selection is based upon the student’s academic record, leadership ability, character and school and community service. Members serve the school as freshman mentors and peer tutors. Peer tutoring is offered through the learning center throughout the school day. Students who would be willing to give up one or two study halls per week in order to help another student should sign up for this service opportunity with their guidance counselor. 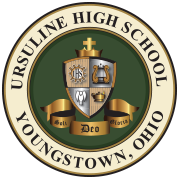 This service and leadership organization actively involves students in the planning and coordination of Ursuline’s marketing and recruitment efforts. These activities include school visits, open house, 5th & 6th Grade Day, and 7th Grade Night. Student Ambassadors also assist in the production of brochures, posters, or other materials for prospective parents and students. Sophomores, juniors, and seniors apply in the fall of the school year. Acceptance as a student ambassador is based on an application, conduct, and attendance. The Ursuline Student Council serves as the school’s student government. Students involved in this organization learn the skills of leadership and organization by becoming actively involved in planning activities that encourage school unity, spirit, and service. It also is the principle vehicle whereby students communicate their concerns to the faculty and administration. A six member executive board, elected by the current student council in the spring, governs the council. Each class elects four officers and six representatives during elections in the spring of each year. Freshman elections are held in early September. Eligibility is based on grade point average and conduct grades.